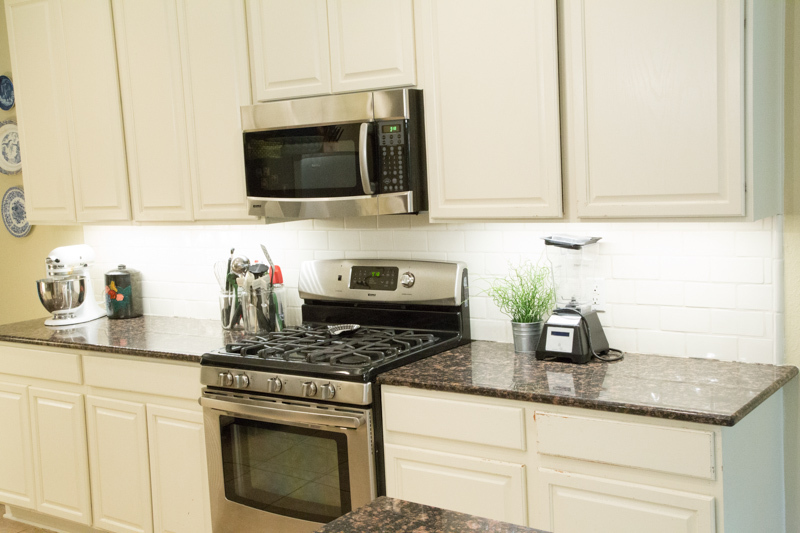 Because a Clean, Decluttered Kitchen Creates a Calm and Peaceful Space! Yes, this is what my kitchen looks like at the end of every day. Every now and again, I’ll get a question/email about my kitchen being so clean and I wanted to share how and why I keep my counters cleared off and decluttered. Have you ever cleaned up/out your kiddos play space and then just sat and watched them play afterwards? The play is calm and peaceful. They are playing with the toys again, nicely. Because the environment is cleaned up again, simplified, if you will. And they can focus on the task/play in front of them without being distracted by whatever other pile of toys is right next to them. Now the same kind of peace and calm happens for me when the kitchen is cleaned and free of clutter. I work a lot in the kitchen – not only cooking, but photographing, shooting videos and just the keeping up with feeding my boys everyday. Not having clutter and distractions keeps me focused on what needs to happen each day in the kitchen – from a big baking day to an all-day video shoot day to just a regular day making dinner. My boys are busy – most days it feels like they don’t stop moving from the time their eyes open until they close them again at night. Literally, don’t stop moving. Inside playing, outside playing, getting breakfast, then a snack, then lunch, then dinner…always on the go. And much of their ‘go time’ happens in and through the kitchen. Another reason I keep the counters clear and certain items in certain cabinets is that then everyone knows where to find things. There’s less ‘searching for my favorite cup’ that happens, because the favorite cup is in the right section of the cabinets. And that’s why I’ve developed 5 daily habits that help me keep my kitchen looking like a “blank slate” or “fresh palette” for me to enjoy working and cooking in every day! Here are 7 things I do daily to keep my kitchen clean and clutter-free. The best part about these habits is that I don’t even think about them, because they just need to happen. They are part of our “kitchen system” and everyone in the family helps keep the center of our home a clean and peaceful-ish place! 1. Morning clean up, evening cleanup. Most days (during the school year) everyone is out of the house for lunch. So I make it a point to clear the counters after the breakfast-lunch packing rush. That means getting all the dishes into dishwasher (and sometimes running it) and wiping down the counters. This sets me up for a ‘clean work space’ when it comes time to cook and get dinner on the table in the evenings. I don’t use paper towels…like ever. Sometimes I’ll use paper napkins for quick cleanup, but I have used reusable dish towels for years. The kitchen is a natural place for the mail to fall. And for a long time it fell on my kitchen counter or my desk at the back of the kitchen (that I don’t really use! ), but then it just sat there and I’d miss deadlines or meetings or getting RSVPs done. So I’ve changed the way our mail works – it gets ‘delivered in the house’ to 3 places…the trash, my husband’s desk and my work desk. When on my work desk, it’ll get taken care of in a timely manner and deadlines/meetings/RSVPs aren’t missed. 3. Toys go upstairs everyday. With all the hustle and bustle that happens through the kitchen everyday, I’ve learned to have a basket at the base of the stairs for all the toys, Lego pieces and anything else that belongs upstairs. I ask the boys to take things to the basket throughout the afternoon and they have learned (are still learning!) to take the basket up when it gets full-ish. Speaking of the boys, they have learned to be really helpful in keeping the kitchen clean. We have taught them to rinse off their dishes and put them straight into the dishwasher. They know where to find cups and plates, etc. when they need them for setting the table, or getting a drink of water. They help clean the counters after meals and will sometimes sweep after if we’ve made a mess on the floors. 5. Everything has a home. I am blessed with a big, bright kitchen with lots of drawer and cabinet space. The kitchen is the reason we bought this home and I’m grateful to have room in cabinets to keep some things off the counter. The potatoes and onions go on a platter in the cabinet next to the cabinet with all the mixing bowls and casserole dishes. The kids plates, cups, lunch boxes and water bottles all go in the bottom cabinets to the right of the stove. They can quickly set the table with their items being close to the table and to the ‘island/peninsula’ where they often eat breakfast or snacks. 6. Get rid of what you aren’t using regularly. You don’t have to get rid of it entirely, but you need to get rid of it from your kitchen. Store small appliances that you don’t use often on a shelf in the garage or other closet in your home. And if it’s a gadget you haven’t used in awhile, find a new home for it! 7. A little time each day. I have built in 5 minutes each morning and evening to give the counters and kitchen a solid cleanup…and doing so has helped me maintain the peace and calm that we all need in the space. It’s easy to not ‘see’ the clutter that builds up in the kitchen because it’s such a bustling place in most homes. I would encourage you to take 30 minutes to declutter and then make it a habit to maintain the clutter-free space. Then come and let me know if it changes the feeling in the room and your efficiency in getting meals made and served to your family. I wanna hear from you. 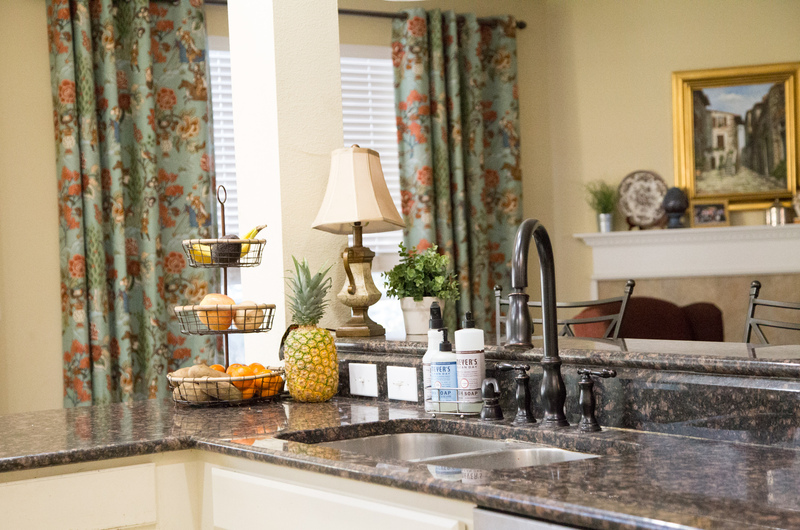 What strategies do you use to keep your kitchen counters clutter-free and the atmosphere one of peace and calm? THESE ARE MY FAVORITE CLEANING PRODUCTS! You can see them above in my pict and I use them daily! 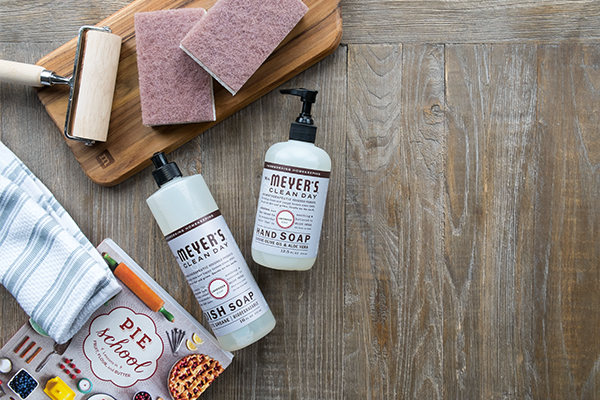 Did you know that you can get a FREE 3-Piece Set from Mrs. Meyer’s & Grove Collaborative with your first order?! With each new customer order of $20, what you see above is FREE! 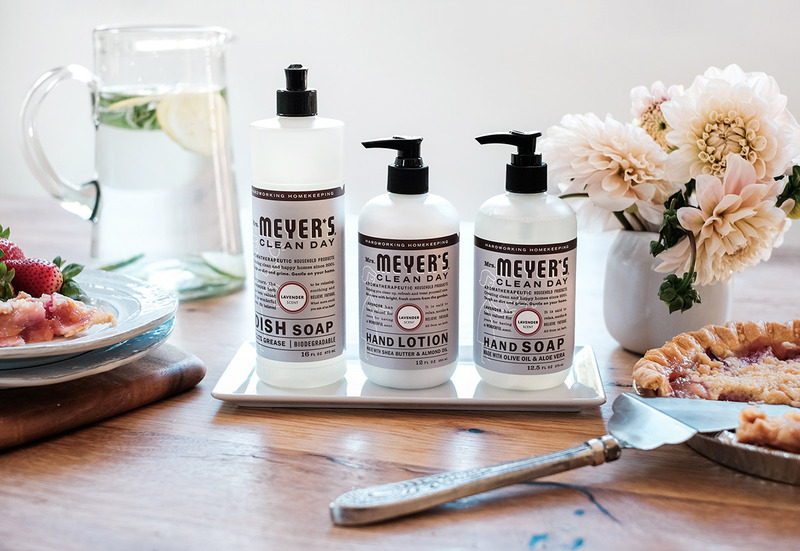 I adore these products…they are always next to my kitchen sink and we have more of the hand soaps by our bathroom sinks too. We love them so much and are now getting the “refill” bottles with our monthly (sometimes every other month) orders. I have been ordering from Grove for years and I love the convenience of the auto-orders, as well as how simple and easy it is to adjust ship dates, etc. I typically get the hand soap refills, sometimes the dish soap refill, and it’s my go-to spot for the kid’s toothpaste. It’s an easy and convenient service, and you can trust the quality of the products you’re ordering too! It’s the perfect trio for your kitchen sink area! As I mentioned, these gift sets kits are free with your first order of $20 or more. Given that they are valued at +$20, I call this a great offer – much like a “buy one, get one free” kind of sale! Sign up for Grove Collaborative to receive this 3-piece gift set. Your order & Gifts will be on their way with your first order! If you’ve heard me talk about these before and wondered, how is that even possible? Well, it’s possible. A few years back, I was a skeptic. And now I’m a believer…not only in this great offer, but also in the company. It’s the place where I get a few different cleaners for our home AND, also the place where I get the kids’ toothbrushes and toothpaste. The box will quickly arrive with your first order AND your free gift set! When you click over to Grove Collaborative, you’ll be asked a few questions based on products you like and use, then your cart will auto-fill with $20 worth of products they suggest, based on your answers to the onboarding questions. (I think this is how I landed on always getting the refills and toothpastes from them!) You can add and remove items from your cart, as well as make adjustments to your future deliveries. They send reminders regularly about your order and your cart. My advice with getting started…add a few things that you’ll use yourself and a few goodies for gifts, and get your free kit while you’re at it! 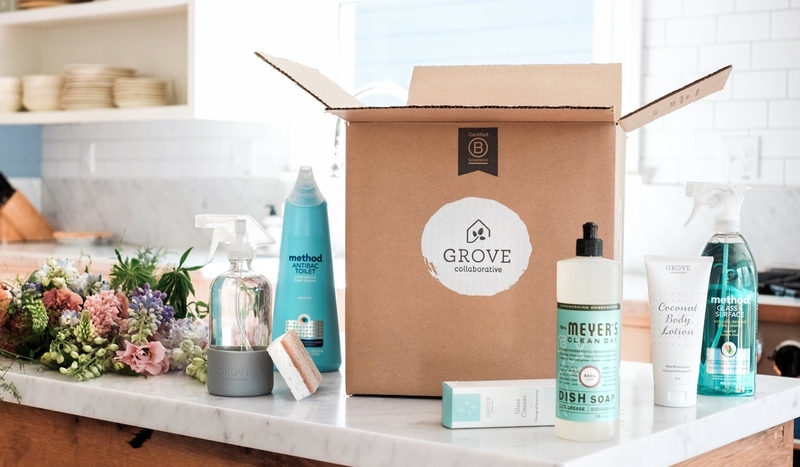 Disclosure: I am thrilled to partner with Grove on this special offer! Thanks for your support of $5 Dinners. Wow, this looks great. I have always wanted to try Meyers.